GOAL: ELIMINATE BROWSING THROUGH MULTIPLE APPS, MULTIPLE TIMES PER DAY, SIMPLIFYING THE SMARTPHONE EXPERIENCE. LIKE MOST PEOPLE, I CONSTANTLY HAVE IDEAS. LIKE A LOT OF PEOPLE, I HAVE A LOT OF IDEAS FOR CONVENIENT MOBILE APPS. UNLIKE MOST PEOPLE, I DON'T LIKE TO THROTTLE GOOD IDEAS BY KEEPING THEM AS JUST IDEAS. 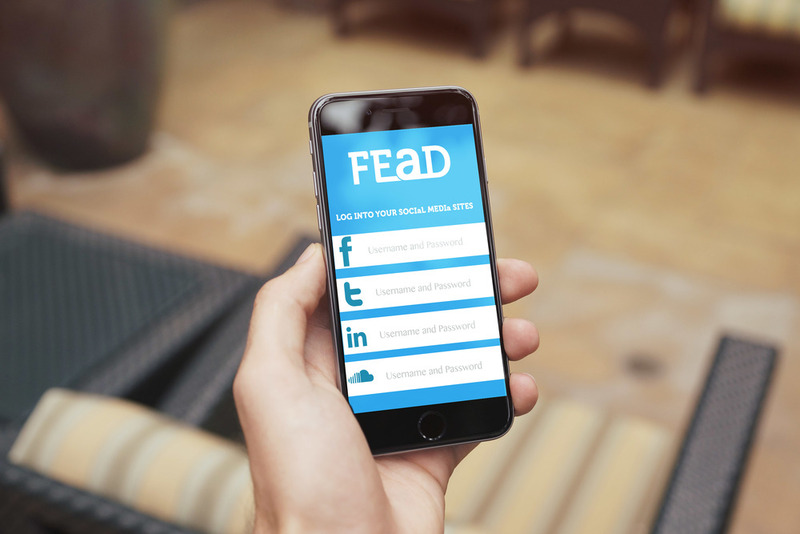 FEAD IS A BRAND AND APPLICATION I DEVELOPED TO SOLVE THE PROBLEM OF UTILIZING MULTIPLE APPLICATIONS FOR YOUR SOCIAL NEEDS. WHEN YOU'RE LAYING IN BED, CHECKING OVER YOUR INSTA, FACEBOOK AND TWITTER, WITH FEAD, YOU'RE ABLE TO SEE ALL OF THE CONTENT YOU WANT TO SEE IN ONE, CUSTOMIZABLE NEWS FEED, AGGREGATING ALL OF THE POSTS YOU WANT TO SEE FROM YOUR FAVORITE SOCIAL MEDIA PLATFORMS. I scroll through at least three apps before I hit the hay. Social media APIs allow usage up to a certain number of users to curate all the content I want to see into one application. The color blue is one of the most common colors among successful mobile applications... and it's my favorite color. People consume social media much like cows graze on fields and consume their fead.